Why Can’t Americans Rank Their Votes? 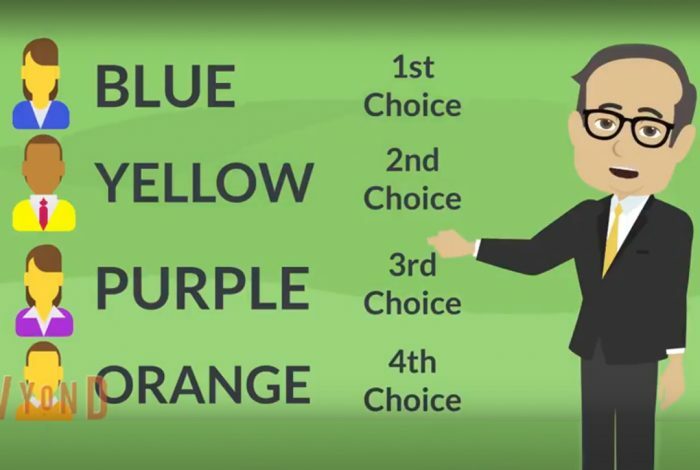 Americans understand what ranked-choice voting (RCV) is — although they may not know it by that name. Whether it’s a couple’s top-five vacation getaway list, a high school student’s top picks for her dream college, or a workplace fantasy football league, people understand the concept of ranking choices from favorite to least favorite — they do it all the time. But when it comes to electing representatives to government office, ranked-choice voting, also called instant-runoff voting, is as unfamiliar as the intricacies of cricket — in large part because the vast majority of Americans don’t have the opportunity to vote in this manner. But that is slowly changing. Most US elections, whether for president, senator, or local county sheriff, work in a similar fashion. Each voter has one vote for only one candidate. Whichever candidate has the most votes wins. Your vote expresses who your top pick is, but if the race has seven candidates, you’ve left unsaid how you feel about those other six candidates in relation to each other. In contrast, advocates say ranked-choice voting provides greater fairness, expression, and freedom of choice — at the expense of simplicity. Your top choice is Hermione Granger. You’re not a huge fan of Donald Duck, but you would sure rather see him win than Fred Flintstone or Spider Man. It’s not difficult to imagine analogous rankings using this kind of voting methodology for, say, the 2016 presidential election. Here’s how RCV works: after all the votes are tallied, if no candidate has a 51 percent majority, then the candidate with the least votes is eliminated, and the people that voted for that eliminated candidate will have their second choice candidate added to the total tally. The process — of dividing up the votes of the next-least popular choice — repeats until a candidate has a majority, and is the winner. With the midterms fast approaching, the stakes are high for Democrats. While the party has focused attention on the problems of gerrymandering and campaign finance, it has not made ranked-choice voting a part of its national platform. But perhaps that shouldn’t be surprising — while a handful of cities across the US use RCV, for federal and state elections, RCV has only recently been implemented in a single state: Maine. In 2016 Maine voted by referendum to implement ranked-choice voting, after Republican Governor Paul LePage had won two elections by splitting the liberal vote. Republicans in the state legislature, with the support of LePage, then passed a bill the following year to delay its implementation until 2022. But this past June, the citizens of Maine overruled the politicians in a state ballot initiative to continue to implement RCV this year. RCV was used for state primaries in June, and will be used for the upcoming November midterms. Only time will tell if RCV catches on in other states, though more voters are seeing its benefits. The videos this week include a speedy explainer of how RCV works using colorful sticky notes, and what the 2016 election outcome might have looked like if this system of voting had been used. Related front page panorama photo credit: Adapted by WhoWhatWhy from woman thinking (RobinHiggins / Pixabay – CC0 1.0) and poster (SteveRhodes / Flickr – CC BY-NC-ND 2.0). 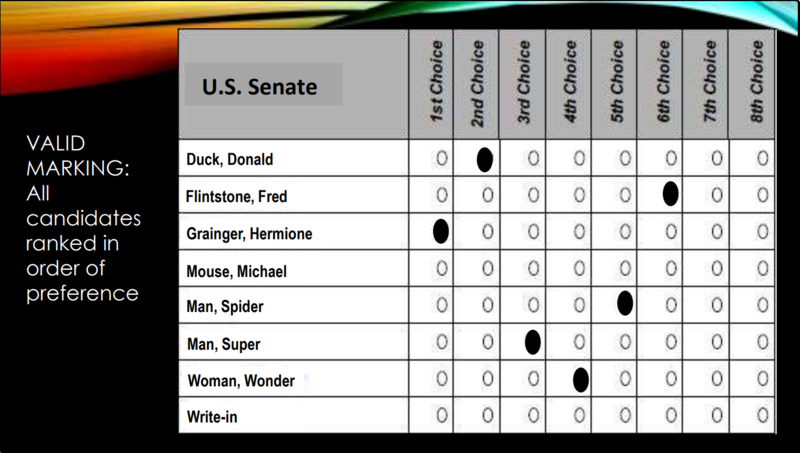 Editor’s note: As fans of Harry Potter, we are aware that Hermione Granger’s name is misspelled in the image we used to explain ranked choice voting. However, since it does a good job of illustrating how this type of election works, we reluctantly still included it. In addition, we believe she would be the best candidate in that particular scenario.